Plentiful Power to conquer the steep mountain passes with a pillion rider, yet still putting a grin on your face with its exciting sportiness. State of the art technology, always there to support a difficult task. Comfort to go on and on, and on. Combining the premium experience with real world usability, the relaxing luxury will let you soar out on your adventures. 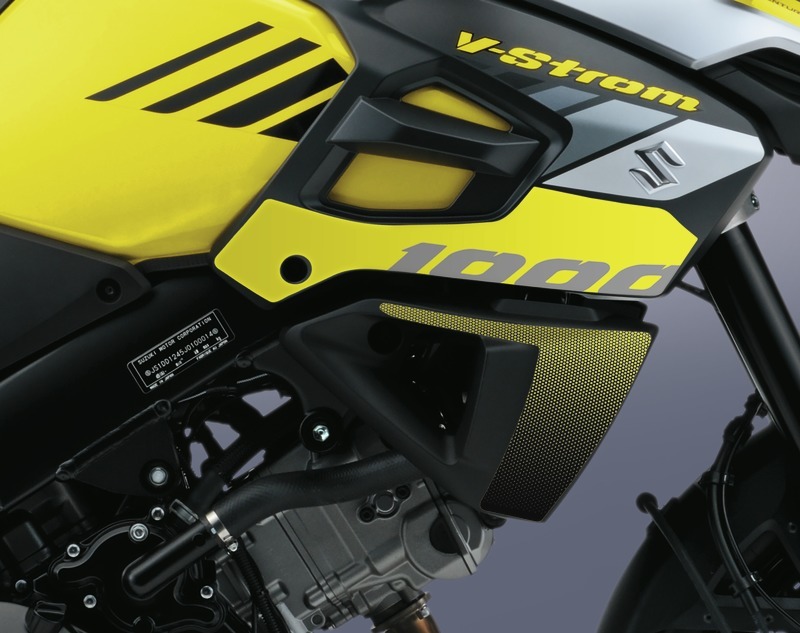 The new V-Strom 1000 is avaliable in two versions, the standard V-Strom 1000 and the more equipped V-Strom 1000XT. BUY NOW WITH ADVENTURE PACKAGE. Contents of the ADVENTURE package: Top case, Side case, Box brackets, Center stand. Inheriting the favored traction control system from the previous model, this system enables the rider to control the throttle with more confidence in difficult riding situations such as stone paved roads, two-up riding or when with a heavy load to minimize the stress and/or fatigue on long distance rides. The traction control system continuously monitors the front and rear wheel speeds, throttle position, crank position, and gear position with various sensors, and controls the engine output by managing the ignition timing and air delivery. The traction control system can be switched to either of two modes, or off. Modes 1 and 2 differ in the timing and levels of intervention. Mode 1 has a lower level of intervention applied at a later timing allowing a certain degree of rear wheel spin, not to interrupt a sporty ride. Mode 2 has a higher level of intervention applied at an instant, controlling and preventing the slightest amount of spin, more actively supporting the rider in situations such as in the rain or on slippery road surfaces. The choice can be quickly and easily made by selecting the traction control mode from the left switch cluster and confirming it with a glance at the instruments. The powerful and versatile 90-degree DOHC V-twin originated as a 996cm3 unit, and underwent a major rebuild changing various components and rising the capacity to 1037cm3 in 2014, further maturing this attractive engine to match the demands of a sports adventure tourer. The strong, rider-friendly nature of this V-twin engine gives effortless acceleration irrelevant to the riding situation or the presence of a pillion rider. The 74kw maximum output at 8000rpm will promise the rider with an exciting riding experience, while with the optimally weighted magneto and flywheel helps to produce a thick layer of torque of 101Nm as low as 4000rpm, resulting in a tremendously usable character allowing the rider to always have the required output and not needing to downshift when overtaking on motorways. The radial mounted four piston mono-block Tokico brake calipers and twin 310mm diameter discs on the front, and a 260mm diameter single disc with a single piston caliper on the rear, provide strong and controllable braking performance. The Bosch ABS system has been upgraded to the “Motion Track Brake System” by installing a 5-Axis Inertial Measurement Unit (IMU), and by combining the information of the posture of the vehicle with the front and rear wheel speeds, realizing optimal vehicle stability not only in straight-line braking but also when breaking while cornering. This new sophisticated system instantly assesses the need of ABS appliance when the lever or pedal is operated by calculating the posture of the vehicle and wheel speeds. When judging the need of appliance, the ABS unit will decrease in braking pressure, and will continue to control the increase/decrease of the pressure at an advanced level according to the traction available. 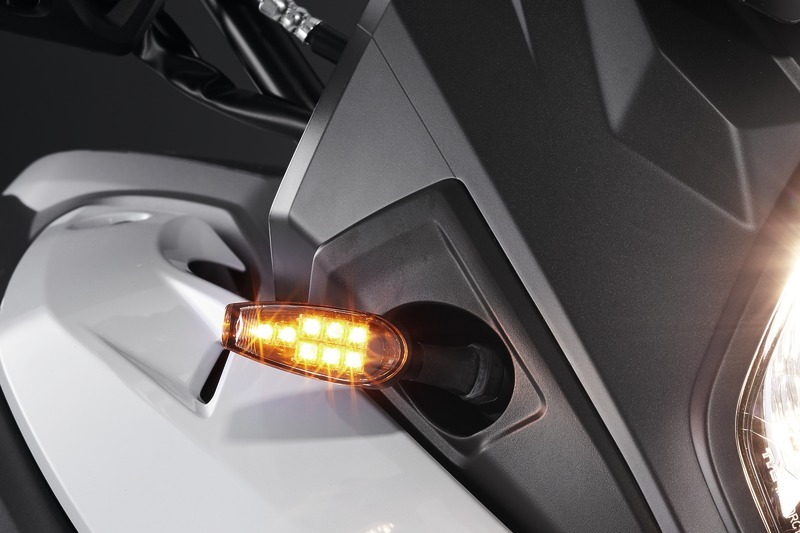 Conventional starter switches needed to be pressed by the rider until the engine starts, but the new V-Strom 1000 ABS has adopted the Suzuki Easy Start System enabling the engine to start with one push of the button. A computerized ECM checks the status and disengages the starter motor immediately after start. 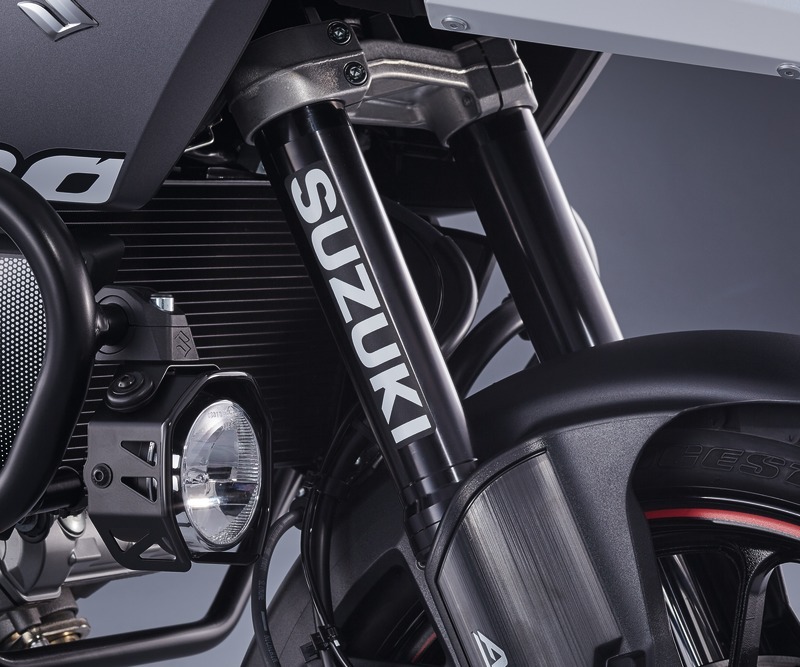 The unique Suzuki Exhaust Tuning (SET) system uses a butterfly valve in the exhaust pipe to optimize the exhaust pressure for running conditions, hereby boosting torque at low revs (a benefit for acceleration) and enhancing throttle response. To meet the Euro4 standards there are now two catalyzers positioned in a tandem configuration achieving an effective level of emission control, resulting the engine to be Euro4 standard while being as attractive as ever. The seat provides luxurious comfort for both the rider and the tandem rider, combined with a sense of controllability for sporty riding by designing the section connecting to the fuel tank slim for a better hold. The height of the seat is kept low and provides ease of reaching the ground and giving the rider a sense of reassurance. 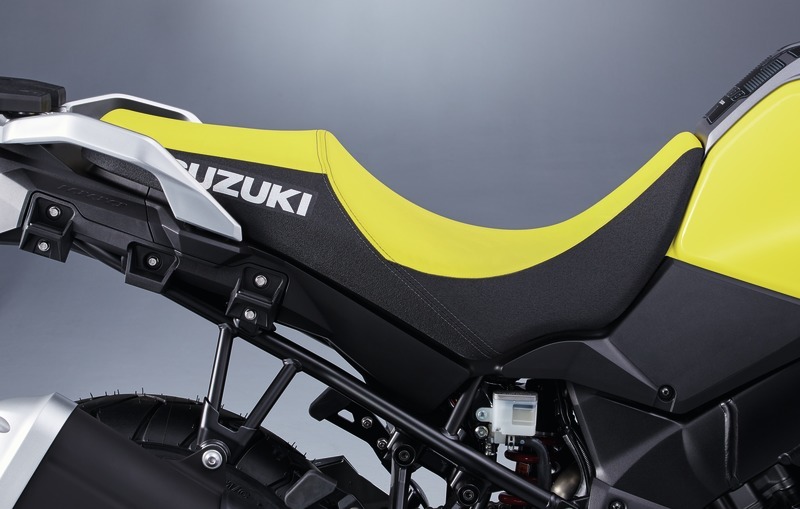 The newly designed double stitch and SUZUKI logo gives the seat a sense of quality, while the side of the seat provides a high level of grip by using same materials as the competition model RM-Z. Reducing the wind blast to the hands of the rider and providing comfort especially in the rain or cold weather, the once optional Knuckle Covers are now standard to support harsh condition riding. Comfort and accurate control to the levers shall further improve by installing the optional Grip Heaters for long distance rides in severe conditions. 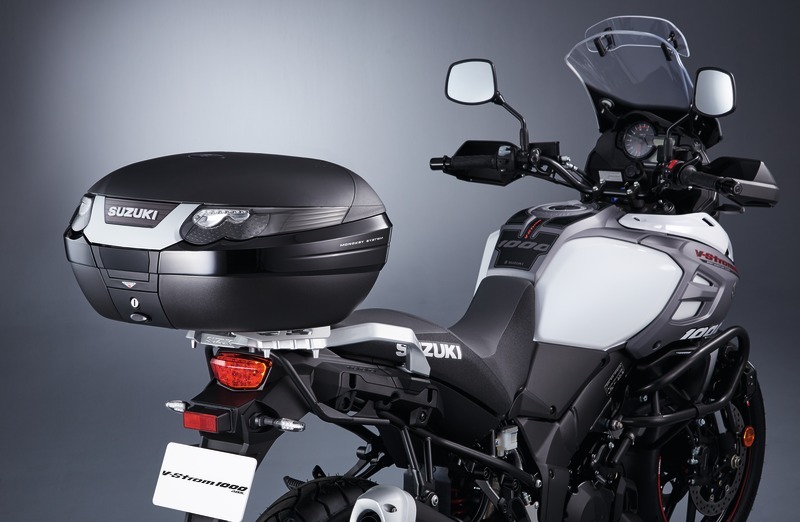 The Under Cowling is also standard to give the rider that extra adventure feel. 19inch wheel on the front and 17 on the rear provides a premium balance of stability and nimbleness to cope well with all riding situations. 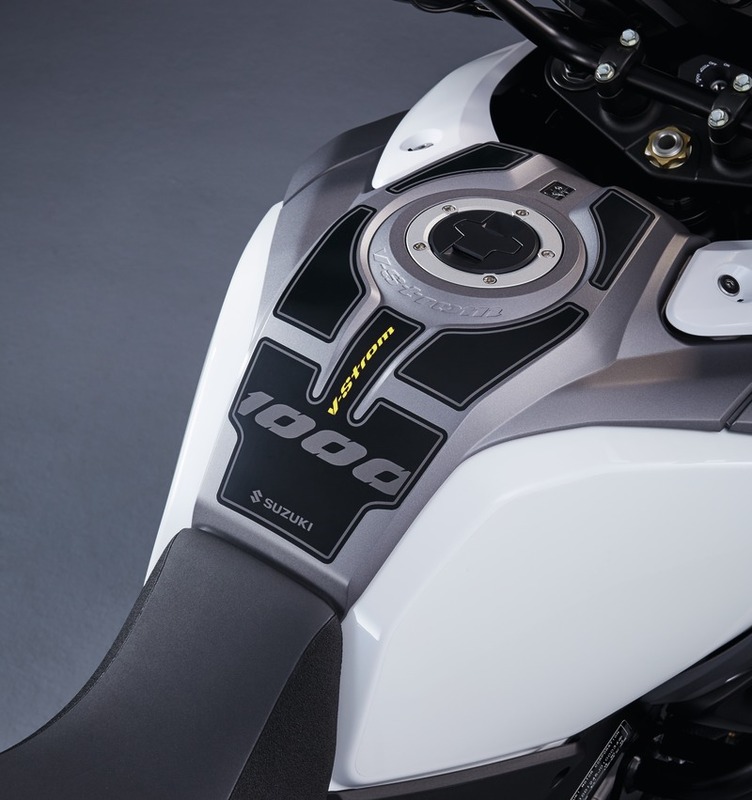 The V-Strom 1000 ABS inherits the light weight 10 spoke aluminum cast wheels, while the V-Strom 1000XT adopts tubeless tire applicable wire-spoke wheels. 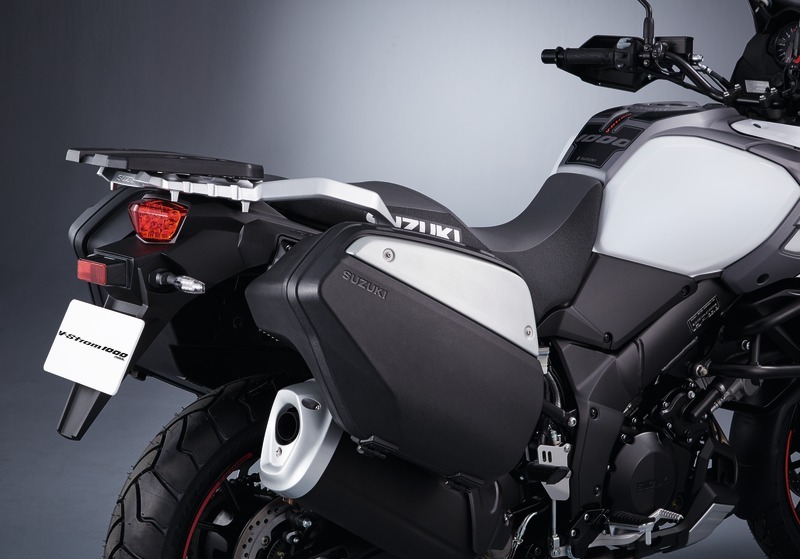 The V-Strom 1000 ABS is built on a slim, twin-spar aluminum-alloy frame, providing a smooth ride, and a sporty riding experience when pushed hard, and also contributing to fuel economy thanks to its light weight structure. 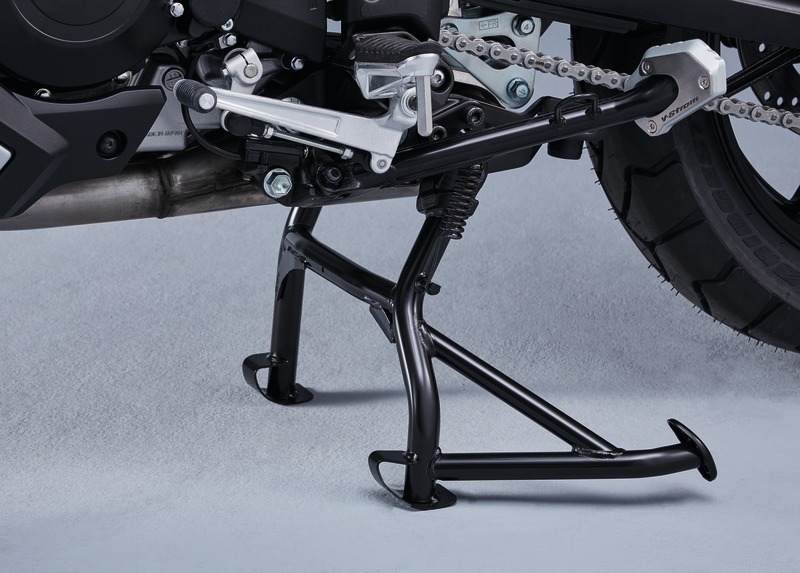 The also aluminum swingarm is set to a length to provide straight-line stability and cornering stability at a high level. The bike feels reassuringly steady at high speeds even when it’s fully loaded with luggage and/or a passenger. Most appreciative in the cold seasons of riding or in the rain, the Grip Heaters have undergone a model change. The new type has a thinner grip and is almost identical to the standard grips making it feel natural even when not using them. Also the switch is built in to the left hand grip making the device compact and easier to fit, while the hot wire inside the grip has been positioned all-round the grip, providing a more effective heating efficiency. The once-optional knuckle covers, affective combined with the Grip heaters, are now standard, while the accessory line up is still rich with items such as LED turn signals, Chain guard, Touring screen, and a Center stand which comes in handy when loading the vehicle. 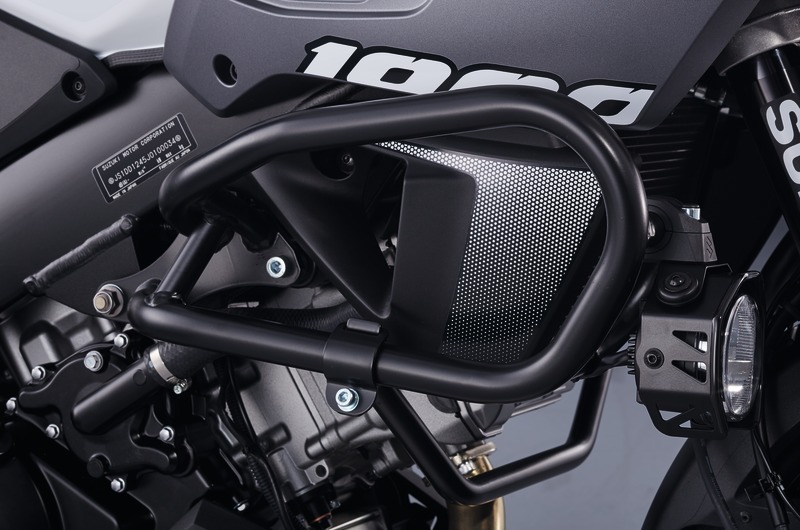 The effective windscreen on the V-Strom 1000 ABS inherits the ratchet-gear mechanism allowing the rider to easily choose from three angles. No tools are necessary and the ideal position can be selected by simply pushing the windscreen by one hand, even with gloves on. The 12V DC outlet positioned below the instrument panel to power satellite navigation systems or recharge mobile devices are just a few things to support your adventure. 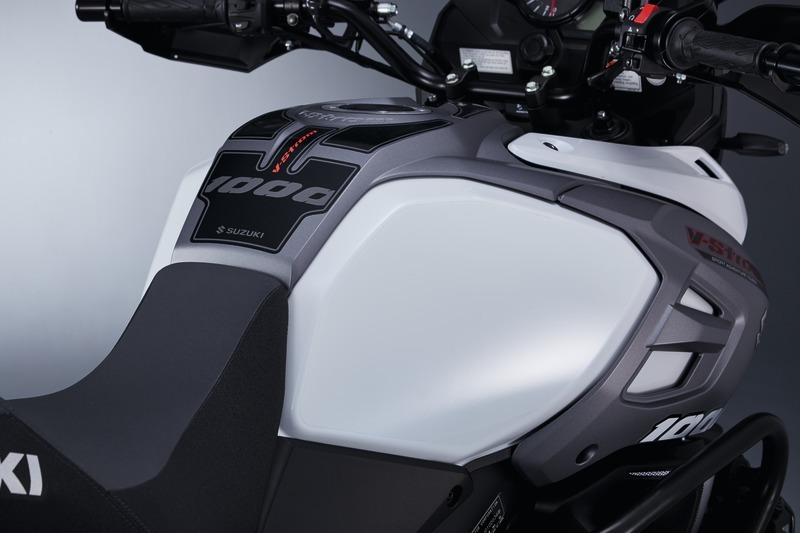 Understandable functionality and ease of use is one of the charms of the V-Strom 1000 ABS. Functions such as the rear suspension preload adjustment needed when riding two-up or with luggage is possible without any tools. The easy to see and easy to operate/understand instrument cluster provides rich information to the rider. It incorporates a big analogue tachometer and large digital readouts for the gear position and speedometer. The digital section below displays the odometer, twin-trip meter, clock, fuel level, coolant temperature, ambient temperature, battery voltage, range on remaining fuel, average and instantaneous fuel consumptions, and traction-control modes.